Galaxy Publishing and Valdoro Entertainment are getting frisky with certain rights, as they've granted Dynamite Entertainment the right to publish original comic book and graphic novel content for Sheena, Queen of the Jungle. Dynamite's rights also include statues, trading cards, action figures, lithographs/fine art and t-shirts. 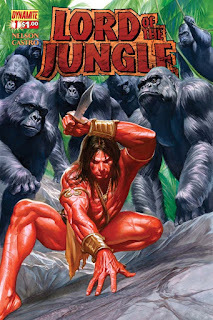 And if that's not enough, Sheena's first appearance with Dynamite Entertainment will see her teamed up with the Lord of the Jungle himself, Tarzan. Dynamite Entertainment has a long history of publishing jungle fantasy and pulp adventure, making it the perfect home for Sheena, Queen of the Jungle. 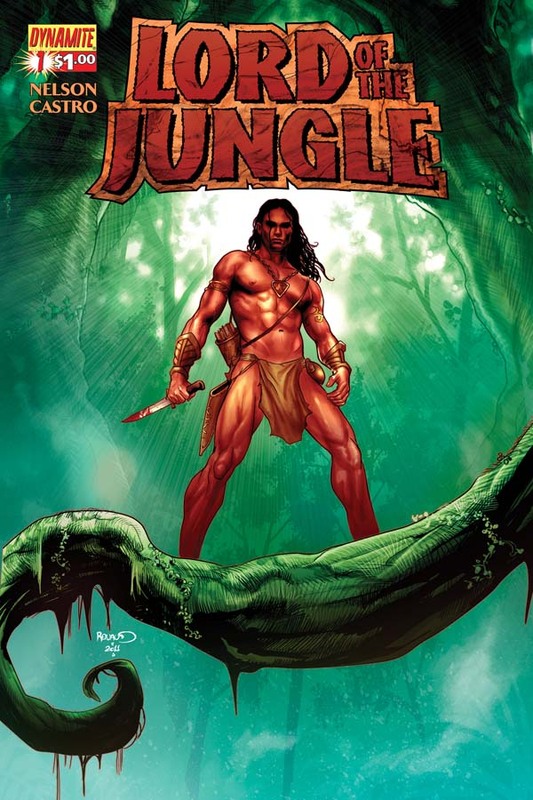 The iconic hero Tarzan appeared in the company's Lord of the Jungle series, as well as the related title Lords of Mars. Dynamite has also published Frank Cho's Jungle Girl, the Frank Frazetta-created Thun'Da, King Features Syndicate's The Phantom and Jungle Jim, Alan Quatermain (of King Solomon's Mines) as a supporting cast member in Prophecy and Savage Tales and Turok: Dinosaur Hunter. Dynamite's Sheena, Queen of the Jungle comics will be solicited in upcoming editions of Diamond Comic Distributors' Previews catalog. Comic book fans are encouraged to reserve copies of Sheena-related projects with their local comic book retailers. Individual customer purchases will be available through digital platforms courtesy of Comixology, Dynamite Digital, iVerse, and Dark Horse Digital. July 8, 2015, Mt. Laurel, NJ: Dynamite Entertainment is proud to announce their agreement with rights holders Galaxy Publishing and Valdoro Entertainment to publish original comic book and graphic novel content for Sheena, Queen of the Jungle, as well as reprints of the character's classic jungle fantasy material. Described by co-creator Will Eisner as a female counterpart to Edgar Rice Burroughs' Tarzan, Sheena will see her first adventure at Dynamite Entertainment teaming with the iconic "Lord of the Jungle" himself. Dynamite's rights also include statues, trading cards, action figures, lithographs / fine art, and t-shirts. Galaxy President Paul Aratow, who in addition to Sheena, also brought Will Eisner's other famous creation The Spirit to Hollywood's attention, says, "When I signed onto this expedition with the Queen of the Jungle, I never could have imagined that the Lord of the Jungle himself would board our safari! Thanks to all who made it happen!" Dynamite was founded in 2004 and is home to several best-selling comic book titles and properties, including The Boys, The Shadow, Red Sonja, Warlord of Mars, Bionic Man, A Game of Thrones, and more. Dynamite owns and controls an extensive library with over 3,000 characters (which includes the Harris Comics and Chaos Comics properties), such as Vampirella, Pantha, Evil Ernie, Smiley the Psychotic Button, Chastity, and Peter Cannon: Thunderbolt. In addition to their critically-acclaimed titles and bestselling comics, Dynamite works with some of the most high profile creators in comics and entertainment, including Kevin Smith, Alex Ross, Neil Gaiman, Andy Diggle, John Cassaday, Garth Ennis, Jae Lee, Marc Guggenheim, Mike Carey, Steven De Souza, Jim Krueger, Greg Pak, Brett Matthews, Matt Wagner, Gail Simone, Steve Niles, James Robinson, and a host of up-and-coming new talent. Dynamite is consistently ranked in the upper tiers of comic book publishers and several of their titles - including Alex Ross and Jim Krueger's Project Superpowers - have debuted in the Top Ten lists produced by Diamond Comics Distributors. In 2005, Diamond awarded the company a GEM award for Best New Publisher and another GEM in 2006 for Comics Publisher of the Year (under 5%) and again in 2011. The company has also been nominated for and won several industry awards, including the prestigious Harvey and Eisner Awards. All characters, names, logos, etc. are ™ and © their respective owners. Tarzan(R) and Lord of The Jungle(TM) owned by Edgar Rice Burroughs, Inc. and Used By Permission.